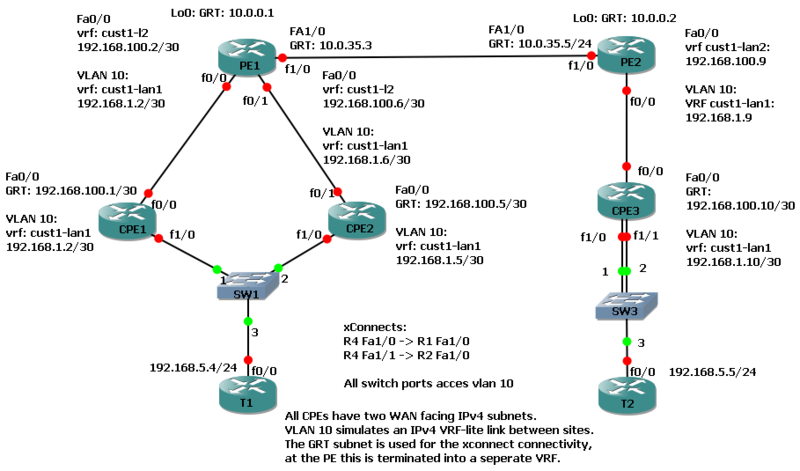 A basic L2TPv3 tunnel configuration between two customer sites with a loop present because the CPEs do not control the forwarding path. An intelligent switch instead of a "dumb" L2 GNS3 simulation switch should work. Side Note: GNS3 isn't the best at simulating a loop, it wasn't looping traffic (not even CDP frames) until I sent several ICMP pings and then it seemed to realise there was a loop (some L2 logic presumably wasn't working correctly) as duplicate ping requests and responses started showing in Wireshark and many CDP frames etc.